Shale Gas and Fracking: The Science Behind the Controversy explains the relevant geological principles before examining the peer-reviewed evidence and presenting it through a simple and compelling illustrated narrative. Each chapter focuses on a particular controversy, such contamination of well water with gas from fracking, and follows a similar format: starting with the principles; then detailing peer-reviewed case studies for earthquakes, radioactivity, and climate change; and concluding with a judgment of the general risks involved. 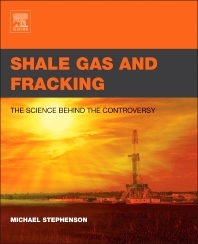 Shale Gas and Fracking: The Science Behind the Controversy provides readers with the unbiased information they need to make informed decisions on the controversial issue of fracking. Chapter 3. To Frack or Not to Frack? How Do Engineers Know Where the Fractures Go? Chapter 4. Gas in Our Water? Chapter 5. Did the Earth Move? So Should Shale Gas Be Left in the Ground? Does Shale Gas Have a Place in Modern Energy? "…an unbiased and highly readable overview of fracking...an important book that should be read by anyone concerned or interested in shale gas or the issues surrounding fracking..."